In the United States, April is Sexual Assault Awareness Month (SAAM). The goal of SAAM is to raise public awareness about sexual violence and educate communities on how to prevent it. This year, SAAM is celebrating its 18th anniversary with the theme “I Ask” to empower everyone to put consent into practice. 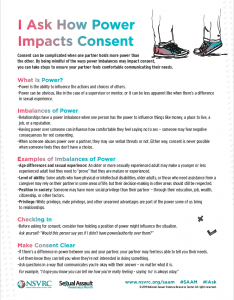 As individuals share the message of the campaign throughout their communities and online, they’ll demonstrate the importance of consent and set an example for their partners, friends, and loved ones. Our words and actions shape the world around us. Whether you are speaking out against “locker room talk” or helping someone better understand these issues, your voice is powerful and necessary in preventing sexual violence, misconduct, and abuse. We know that one month isn’t enough to solve the serious and widespread issue of sexual violence. However, the attention April generates is an opportunity to energize and expand prevention efforts throughout the year. Sexual assault is a serious and widespread problem. The majority of sexual assaults, an estimated 63%, are never reported to the police. Despite misconceptions, the prevalence of false reporting for sexual assault crimes is low — between two percent and 10 percent. The good news is that prevention is possible and it’s happening. Individuals, communities, and the private sector are already successfully combatting the risk of sexual harassment, misconduct, and abuse through conversations, programs, policies, and research-based tools that promote safety, respect, and equality. Use the color teal and the teal ribbon! Teal is the official color of Sexual Assault Awareness Month. The teal ribbon is the symbol of sexual violence prevention.